user warning: Table './active5_foxes/cache_filter' is marked as crashed and should be repaired query: SELECT data, created, headers, expire, serialized FROM cache_filter WHERE cid = '2:e25b88c46d0f077b5cb92dee44dc914a' in /home/active5/public_html/drupal6_multisite/includes/cache.inc on line 25.
user warning: Table './active5_foxes/cache_filter' is marked as crashed and should be repaired query: UPDATE cache_filter SET data = '<p class=\"rtecenter\"><img alt=\"\" src=\"http://www.catchingfoxes.com/sites/www.catchingfoxes.com/files/blog/iStock_000000300188XSmall.jpg\" style=\"width: 427px; height: 281px; border-width: 5px; border-style: solid; margin: 10px;\" title=\"\" width=\"427\" height=\"281\" /></p>\n<p><em>Our new baby came home on July 31, 2013. In the middle of his first night he went into respiratory distress due to a mucus plug blocking his tracheotomy tube. God used our hands to provide emergency care </em><em>and preserved his life. Today we celebrate 100 days with him in our family and I celebrate by sharing a bit of our story.</em></p>\n<p>Everyone stared at me, at the baby in my arms, at my fingers holding the tracheotomy tube in his throat. A man in a white shirt stepped directly in front of me. Intimately close. &ldquo;I am in charge of this crew. What can we do to get you and the baby to the ambulance?&rdquo;</p>\n<p>	He was calm and confident. He asked simple questions that helped me process what I needed. State foster placement papers. The baby&rsquo;s insurance card. &ldquo;Shoes,&rdquo; I said, &ldquo;I need shoes.&rdquo;</p>\n<p>Shoes appeared. Rich. The room was crowded with men in first responder blue uniforms waiting for directions, but Rich had anticipated. Responded. Shoes were at my feet, laces open, ready to step into, but my husband quickly left to find the other things I had listed.</p>\n<p>I needed trach ties. The suction machine. The emergency airway bag. Another tracheotomy tube just in case this nightmare happened all over again before we got somewhere safe.</p>\n<p>	&ldquo;Can we go now?&rdquo; inquired the man in the white shirt.</p>\n<p>	&ldquo;Can someone tie my shoes so I don&rsquo;t trip and fall?&rdquo; I pleaded. Two blue shirts dropped to my feet.</p>\n<p>	The white shirted man smiled kindly. &ldquo;You saved your son&rsquo;s life tonight with that emergency trach change. You did great.&rdquo;</p>\n<p>	&ldquo;He&rsquo;s my foster child,&rdquo; I clarified as we walked out of the house. The baby felt too new in my arms to claim as my own. &nbsp;&ldquo;He came to live with us less than fifteen hours ago,&rdquo; I added as I searched the yard for Rich&rsquo;s face. 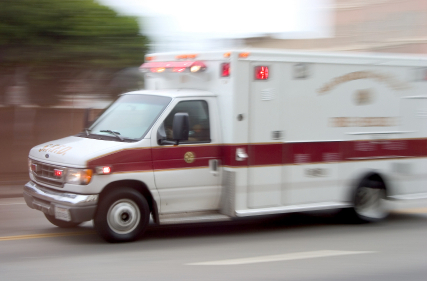 The man noticed my need for assurance.</p>\n<p>&ldquo;You are going to ride in the ambulance with the baby and me. Your husband is going to follow us in your car. He&rsquo;s getting his wallet and keys now.&rdquo;</p>\n<p>The night nurse responsible for our baby&rsquo;s care since 10:00 p.m. stepped into our path. She wanted to administer his 5 a.m. medicines &ndash; a continuation of her irrational priorities since the baby had woken with a blocked tracheotomy tube minutes earlier. The man in the white shirt ignored her and pressed me on toward the ambulance.</p>\n<p>	He insisted we buckle the baby onto the gurney and then leaned across the thin bed towards me. &ldquo;I do not know how to care for an infant with a tracheotomy tube, but I can follow your directions. I will do everything exactly as you tell me. What do we need to do next?&rdquo;</p>\n<p>We put trach ties around the baby&rsquo;s neck so that maintaining his open airway was no longer dependent on my two fingers holding the tube in place. He connected the oxygen monitor taken from my freshly painted nursery to the ambulance system. I explained how deep to suction and where an extra trach tube was in my emergency bag. We discussed current medicines, medical conditions, and previous surgeries. He noted that fifteen hours as a new mom I was training someone. I asked for a drink and he shared a new Gatorade from his lunch box.</p>\n<p>The siren sounded and he leaned close to me again. &ldquo;Are you going to keep this foster baby if he needs a home and family? Or did tonight scare you away?&rdquo;</p>\n<p>	&ldquo;We&#39;ve already been chosen as his adoptive placement,&rdquo; I answered. &ldquo;This is forever.&rdquo;</p>\n<p>&ldquo;Thank you,&quot; he replied and quickly looked away from my questioning expression. He looked back. Deeply. Full of emotion. &ldquo;I&rsquo;m adopted too.&rdquo;</p>\n', created = 1555821577, expire = 1555907977, headers = '', serialized = 0 WHERE cid = '2:e25b88c46d0f077b5cb92dee44dc914a' in /home/active5/public_html/drupal6_multisite/includes/cache.inc on line 108.
user warning: Table './active5_foxes/cache_filter' is marked as crashed and should be repaired query: UPDATE cache_filter SET data = '<p class=\"rtecenter\" style=\"\"><a href=\"http://www.facebook.com/CatchingFoxes\" target=\"_blank\"><img alt=\"\" src=\"/sites/www.catchingfoxes.com/files/resize/social/facebook-64x64.png\" style=\"text-align: center; width: 64px; height: 64px; \" width=\"64\" height=\"64\" /></a><a href=\"http://pinterest.com/kimmrankin/\" target=\"_blank\"><img alt=\"\" src=\"/sites/www.catchingfoxes.com/files/resize/social/big-p-button-64x64.png\" style=\"width: 64px; height: 64px; \" width=\"64\" height=\"64\" /></a><a href=\"mailto:kim@catchingfoxes.com\" target=\"_blank\"><img alt=\"\" src=\"/sites/www.catchingfoxes.com/files/resize/social/mail-64x64.png\" style=\"width: 64px; height: 64px; \" width=\"64\" height=\"64\" /></a><a href=\"http://www.catchingfoxes.com/rss.xml\" target=\"_blank\"><img alt=\"\" src=\"/sites/www.catchingfoxes.com/files/resize/social/rss-64x64.png\" style=\"width: 64px; height: 64px; \" width=\"64\" height=\"64\" /></a></p>\n', created = 1555821577, expire = 1555907977, headers = '', serialized = 0 WHERE cid = '2:48be9f28bc948ea32b70445d0a590c98' in /home/active5/public_html/drupal6_multisite/includes/cache.inc on line 108.
user warning: Table './active5_foxes/cache_filter' is marked as crashed and should be repaired query: UPDATE cache_filter SET data = '<div class=\"fb-like\" data-font=\"verdana\" data-href=\"http://www.facebook.com/CatchingFoxes\" data-send=\"false\" data-show-faces=\"true\" data-width=\"280\">\n	&nbsp;</div>\n', created = 1555821577, expire = 1555907977, headers = '', serialized = 0 WHERE cid = '2:854065b9b61ff8596c8fa62e384317c7' in /home/active5/public_html/drupal6_multisite/includes/cache.inc on line 108.
user warning: Table './active5_foxes/cache_filter' is marked as crashed and should be repaired query: UPDATE cache_filter SET data = '<p><strong>Catch for us the foxes, the little foxes that ruin the vineyards, our vineyards that are in bloom. </strong><br /><em>Song of Solomon 2:15 NIV</em></p>\n<p>Metaphorically, the &quot;foxes&quot; are the damaging attitudes and actions that can creep in and threaten the love relationship of a couple and a home. &nbsp;Catching Foxes is committed to being a resource as you guard against the things that might injure and destroy the harvest you are striving to grow in your home.</p>\n', created = 1555821577, expire = 1555907977, headers = '', serialized = 0 WHERE cid = '2:132a8457abcc78748ef29251eaa8f1d7' in /home/active5/public_html/drupal6_multisite/includes/cache.inc on line 108.
user warning: Table './active5_foxes/cache_filter' is marked as crashed and should be repaired query: UPDATE cache_filter SET data = '<p><a href=\"mailto:kim@catchingfoxes.com\">kim@catchingfoxes.com</a></p>\n', created = 1555821577, expire = 1555907977, headers = '', serialized = 0 WHERE cid = '2:fe7b2055d10a2c25c439ca4710d86502' in /home/active5/public_html/drupal6_multisite/includes/cache.inc on line 108. Shoes appeared. Rich. The room was crowded with men in first responder blue uniforms waiting for directions, but Rich had anticipated. Responded. Shoes were at my feet, laces open, ready to step into, but my husband quickly left to find the other things I had listed. I needed trach ties. The suction machine. The emergency airway bag. Another tracheotomy tube just in case this nightmare happened all over again before we got somewhere safe. “Can we go now?” inquired the man in the white shirt. “Can someone tie my shoes so I don’t trip and fall?” I pleaded. Two blue shirts dropped to my feet. “He’s my foster child,” I clarified as we walked out of the house. The baby felt too new in my arms to claim as my own. “He came to live with us less than fifteen hours ago,” I added as I searched the yard for Rich’s face. The man noticed my need for assurance. The night nurse responsible for our baby’s care since 10:00 p.m. stepped into our path. She wanted to administer his 5 a.m. medicines – a continuation of her irrational priorities since the baby had woken with a blocked tracheotomy tube minutes earlier. The man in the white shirt ignored her and pressed me on toward the ambulance. We put trach ties around the baby’s neck so that maintaining his open airway was no longer dependent on my two fingers holding the tube in place. He connected the oxygen monitor taken from my freshly painted nursery to the ambulance system. I explained how deep to suction and where an extra trach tube was in my emergency bag. We discussed current medicines, medical conditions, and previous surgeries. He noted that fifteen hours as a new mom I was training someone. I asked for a drink and he shared a new Gatorade from his lunch box.